Ask for assistance - we are itching to help you! We regularly highlight cruise packages available with top cruise liners such as the MSC Musica and MSC Orchestra for the 2019/2020 seasons - brand new and revamped with more family cabins and other renovations. Watch this space! There are also the occasional cruise specials with Crystal Cruises, Oceania Cruises & Cunard from Cape Town. And check out our tips for budgeting for your cruise. Email cruises@southafrica.to to make a booking. Don't forget that on MSC, if there are already 2 paying passengers, then kids pay NO cabin fare! You all need to be cosy in one cabin though; this doesn't apply if the kids are in a separate cabin. And remember that to qualify, the kids need to be under 18 at the time the cruise returns. Cruise prices change even during the day. To get hold of the latest cruise specials fill in the Durban cruises, Cape Town cruises or Mediterranean cruises forms (or email cruises@southafrica.to). If you are based outside of South Africa and are looking for deals outside of South Africa (e.g. dollars or pound denominated - non-Rand) then click here to be guided to finding special deals. We give cruise vouchers to anybody who emails us a write up of their cruise and/or photos & includes a 1 (worst) to 5 (best) rating of the experience. 2 August 2013. Have you cruised before? If so, you have the opportunity to earn cruise discount vouchers for the next season by emailing us a review of your previous cruise. 29 May 2013. 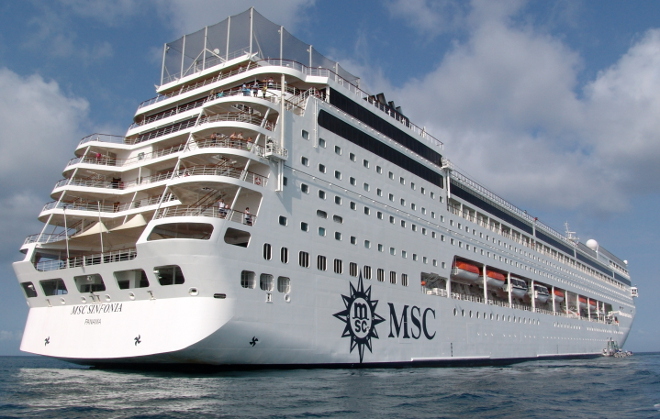 To get the best fares look for MSC Cruises on Prima Special. There are several packages to choose from to suit your individual taste and needs. The ships cover a number of places depending on the voyage you decide to take. They sail around in many areas such as Portland, the Canary Islands, the Portuguese Islands, the Mother City, Mauritius, Maputo and Durban to name but a few. The cabins are comfortable and some ships offer space for over 2000 guests. The ships are equipped with pools, jacuzzis, gyms, salons, casinos and different shops (some like the MSC Sinfonia even with internet access through its satellite connection). The best part is that since you will be staying on board there is no need to pack and unpack, whilst you visit beautiful islands, towns and rain forests without the hassle of luggage. Unlike air flights, you will have sufficient time to rest, freshen up and be ready for your next excursion. It's almost like walking out your front door every morning into a new land. Imagine cruising on a smaller ship like the RMS St Helena where the focus is placed on relaxation. There is no disturbance from the outside world and you can enjoy the hours by simply basking in the sun. There are also relaxing and amusing games that can be played in the evening such as bingo, and many other quizzes. However if you prefer something more lively and fun then the MSC Sinfonia is the perfect choice. It's a cruise ship for hopeless romantics as it boasts an Italian atmosphere, from the interior design to the scrumptious meals you that make you feel as if you are in a foreign country. You can also treat yourself at the exotic spas and well maintained gyms that are available for use on board. This ship also has state of the art golf Virtual Golf Simulator where players can have a go at their swings. The MSC Sinfonia's sister ship the MSC Opera boasts 4 restaurants and 11 bars as well as loads of entertainment for all guests. There will always be something to do are the choice for entertaining yourself seems endless. Cruising is not just for the young and rich. With special packages almost anyone can get on board and enjoy the journey to the fullest. You can meet new people on board, make new friends, discover new activities and places and of course bond with your loved ones. You can take back a part of your journey with you, a taste of other beliefs and cultures will remain in your heart for years to come. These cruises are not just cruises but delightful holidays that will make you rediscover your true self. So get off that couch and make your way to a world of endless adventures and book a cruise today. So, you've booked a great cruise special - nicely played, but that's only half the battle - smart travellers aim to minimise any flight prices, shuttles, accommodation, prebook spa packages (it's cheaper than paying on board) and formulate a plan for shore excursions, laundry, duty free shops, internet & any service fees. If you book a cruise departing from Durban or Cape Town, most of the essentials are paid for up front. The cruise cost includes your accommodation, food, most entertainment, insurance, port fees, service fees, access to the gym, entrance to the nightclub and daily teas and coffees. However there are a few costs you need to take into consideration pre, post and during your cruise. If you want to budget successfully, we recommend booking as many things up front as possible to know exactly what you are going to need to cover financially. Three things to keep an eye out for: flight specials, flight specials & flight specials! If you do not reside in the area of the cruise departure point, you need to book flights to and from your destination. Booking flights in advance will help save you from the last minute escalated prices. Flying with only a few hours to spare before your cruise departs can be VERY stressful - we recommend spending at least one night in your port city before your cruise. Instead of booking a taxi which could charge your family foreigner rates, plan ahead of time and pre-book your shuttle with us for your cruise. To make things extra simple for you, we will add the shuttle onto the cruise booking and the tickets for this are produced with your cruise ticket. The price from Durban airport to the harbour and vice versa is R130 per person. The price from Cape Town harbour to the airport and vice versa is R140 per person. Thinking of spending a few extra days before or after your cruise in Cape Town or Durban? We offer special deals at affiliated hotels to give you the best price. Email cruises@southafrica.to to find out which hotels we have to offer and the price for your family. Do you enjoy wine or sparking wine? Maybe some delicious ice-cream and sodas for the kids? Instead of purchasing this onboard priced in Dollars, pre-book the package and have the advantage of paying for it beforehand, in Rands. If you are celebrating a birthday, anniversary or any other occasion, these packages are just the extra special touch you need. Email cruises@southafrica.to for the extended list of pre-paid packages which you can add onto your cruise booking to make your cruise extra memorable. If you are booking a cruise where you get the option to get off at different ports and explore, there are pre-planned activities which you can book and pay for at the end of your cruise. These excursions are charged in Dollars. If you are wanting to save some money, you are allowed to get off the ship and tour around on your own. Plan ahead of your cruise and get maps or brochures of the areas you are sailing to. You can enjoy a self-guided walking tour and not have to pay the charged rate. You have to keep in mind the times the ship is leaving as it will not wait for you if you are not back in time. The ships offer a laundry service but be warned, this service is offered at quite a hefty cost. If we had to convert from Dollars to Rands, the cost to wash and iron one sock is about R30, a shirt about R60 and jeans about R90 per item. We suggest avoiding the laundry service and packing an outfit for each day. If you are booked onto the positioning cruises which last for 20 days, then avoiding the laundry service completely might be a bit smelly hard. Planning on taking a souvenir home to your friends or family? You might think twice after browsing the shops. Buying a gift at duty free is completely up to each individual and how much you are willing to spend. The one suggestion I will recommend is waiting for the last day of the cruise. Discount tables are set up usually on the pool deck with items which are on sale from duty free. Make sure to wait for these sales to save an extra buck or two. Try and avoid facebooking or emailing loved ones to update them on your cruise experience. The cost for internet onboard the ship is quite expensive and could dent your account considerably. If you are cruising to a port where there will be wi-fi, rather wait and make use of the free service. You can then tweet, email or update your facebook status as much as you like. If you have booked an international cruise, it is more convenient to pay for your service fees beforehand so that you can budget your savings for other packages or activities onboard. If you are booked on a cruise departing from Cape Town or Durban, the service fee is included in the cruise cost. This includes all your tipping for the housekeeping staff and waiters. The bartenders add an automatic gratuity of 15% to every drink purchased and tipping on top of this is not necessary but is welcomed. Flights to the port departing the day before your cruise are usually cheaper, and always less stressful, than flights which leave on the morning of a cruise starting (same applies for the end of the cruise). Why not arrive a couple of days before your cruise and leave a couple of days after? With the above tips, you should be able to enjoy your cruise experience without breaking the bank. The most important thing to remember is to enjoy yourself, to relax and make the most of your holiday.